A good spicy chicken curry is always appreciated by my hubby and my elder son. My younger ones still enjoy them with plain yogurt on the side. Spices are known to fight against inflammation and cold. So I usually spice up the curries during winter season. Experimenting with variations to ingredients in the regular chicken curry is habitual in my Kitchen. 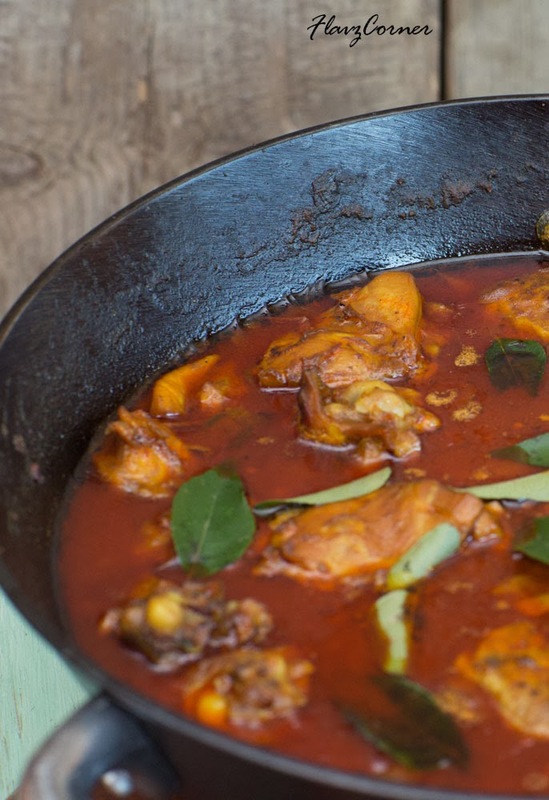 One of those experiments eventuated in the creation of this spicy and flavorful Chicken Curry which is not only appealing to the eyes but also a toothsome dish. It can be paired with Vegetable Fried Rice, Naan, Roti, Chapathis or Appam (South Indian laced rice crepes). I would like you to judge the dish by trying it. 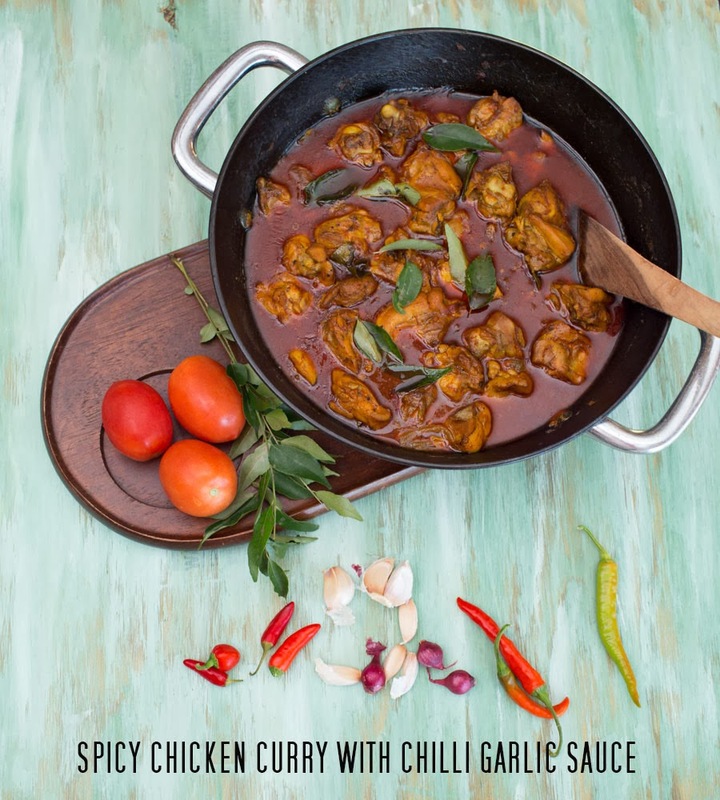 Without much ado, here goes the recipe for 'Spicy Chicken Curry With Chilli Garlic Sauce'. Marinate the cleaned chicken pieces with all the ingredients from the first list and refrigerate for 30 minutes. In a deep cast iron wok or non-stick pan, splutter mustard seeds in oil. 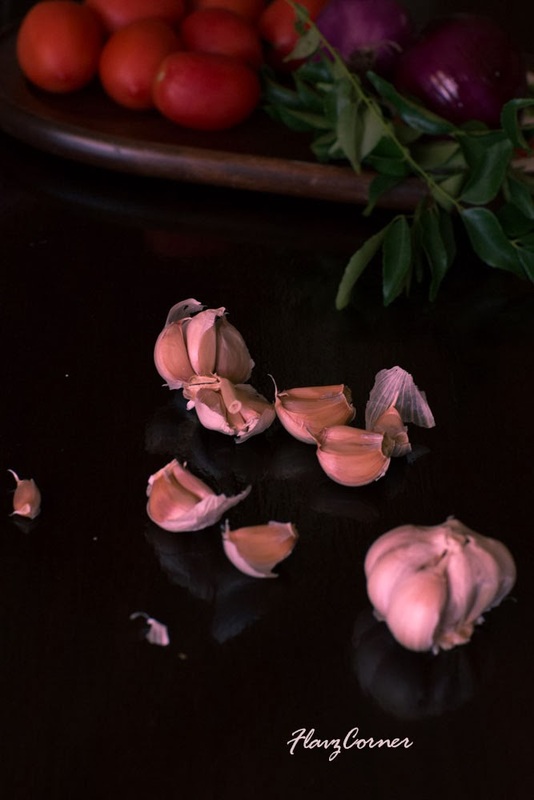 Saute chopped ginger and garlic for 2 minutes. Add sliced onions and salt and saute till the onions are translucent. Add tomatoes; cover and cook for 2 minutes or till he tomatoes are mushy. Now add all the powders like Kashmiri chilli powder, coriander powder, garam masala, turmeric powder, pepper powder and asafoetida and saute till the raw smell is completed gone. It should become a thick paste. Add the curry leaves to the mix. Add the marinated chicken pieces into this masala with 3 tbsp of Chilli garlic sauce and mix well to coat the chicken and cover the wok with a lid and cook for 7 - 8 minutes. Mix in between so that it will not stick to the bottom of the pan. Now remove the lid and add 1/2 cup of water. Cover and cook on medium heat for 20-25 minutes or till the chicken is well cooked and the gravy becomes thick. Garnish with fresh curry leaves and 2 tbsp Chilli Garlic sauce. Enjoy with steamed rice, naan, rotis or chapathi. Chilli Garlic Sauce - I used the Maggi Chilli Garlic sauce, which you can get from Indian stores. Asafoetida is a spice used to enhance flavors in Indian dishes. It is the dried gum of a rhizome. You can get the powder form or the solid form from Indian stores. Kashmiri chilli powder used in this recipe gives the nice red color to the curry, so don't skip that ingredient. Also available at Indian stores. I usually make this curry in cast iron wok which helps me to saute the onions with less amount of oil and cooks faster too. It tastes better too. Make sure you cook the chicken with the gravy for at least 7-8 minutes without adding water so that the spices added to marinate the chicken and cooked and the raw turmeric smell will be gone. The name itself sounds good. I love spicy chicken curries. Will definitely give this a shot! What a delicious looking curry...The gravy look super good... I love chicken curry any time of the day! Never tried the garlic sauce. Great looking soup! I love spice. And soup. And we eat a lot of spicy soup at this time of the year. Definitely something I should make - thanks. That colour is superb. Too tempting for a chicken lover like me...didn't know that spices will help fight cold. goa hours consider spicing up my curries too then..but our tolerance level has gone down way below 0 now so its going to be tough !! This is not too spicy as the color shows. The color is mainly from the sauce and tomatoes added. Also the chicken absorbs the spices and its not very hot either. I will not try anything super hot because even I cannot handle too much of heat, so do my younger ones. So this is like a mild-medium spicy dish when compared to regular kerala chicken curry. ente Shibi....this looks so so good. And I'm not exaggerating to say something nice. That gravy, the color , I can almost smell it..yummm! I always read your posts, mostly while i'm on the bus , but unable to post a comment. So don't think i'm not reading your posts ok :-) Thanks to fb I get to know your updates most of the time. Aww....Thanks Manju!!! I know that I can always count on you :). You should have seen my face (wide smile) while reading your comment. You made my day dear!! 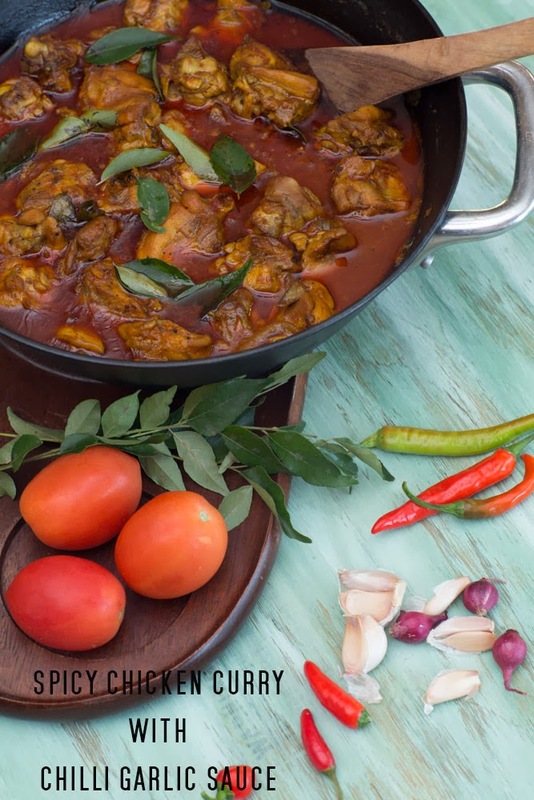 Oh my...this Spicy Chicken Curry With Chilli Garlic Sauce looks so yummy and flavorful. All I need is a bowl of rice....or two. :) I'll be a happy camper. I would love a 2nd bowl of rice! The curry look super, Shibi. Very attractive..the color itself pulling me towards it. We keralites always luv spicy food. Following you for nice recipes like this.